а) Titanium nitride, which has a gold color. This coating is widely used in medicine and food industry, construction, the jewelry industry. When titanium nitride coating on the surface of the cutting tool surface hardness of 2800 HV (80HRC) friction coefficient of about 0.5 Thermal stability up to 540 degrees. Using the above advantages it allows to increase the cutting tool feed, improve wear resistance and durability of the cutting tool during its coating of titanium nitride. b) Titanium nitride - alumina has a surface hardness of the same as that of titanium nitride. Its main advantage is to work at higher temperatures above 750 degrees. Very effective for the treatment of intractable tool steels, stainless steel, titanium, non-ferrous metals and cast iron. 12) we can be subcontractor if your company won a tender for supply titanium nitride coated roofing material. We have titanium nitride coated stainless steel sheets ready for sale in stock. Technology of vacuum evaporation is used when depositing decorative composite coating on materials of internal and external design of architectural buildings, roofs of temples and domes, consumer goods and bijouterie. Coating with persistent ecologically clean materials (titanium nitrides, carbides, oxides, titanium carbooxinitrides, gold and other precious metals and alloys, diamond-like carbon) is made on sheet or shaped articles from stainless steel, glass and other materials by vacuum ionic technologies, reactive magnetron sputtering and arc spraying in modern spraying systems. Materials with such composite coating are suggested to be used when decorating facades, dome and temple roofs coating and buildings internal and external design decorating, gold-plate changing on different articles of church and society purposes. 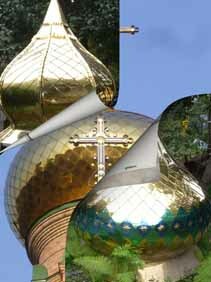 Titanium nitride is applied for domes of religious buildings because it is able to change tinsel at considerable depreciation of works and materials. Such technology allows depositing galvanic coating on articles of large dimensions including stainless steel articles. Such technology is applied for decorating and restoration of art and antiquarian articles, auto accessories, mobile telephones frames, household equipment, articles of church plate, church domes and crosses. 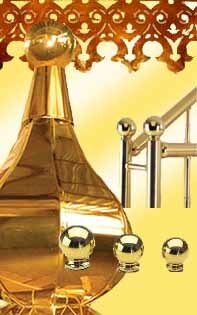 Gilded sanitary engineering from stainless steel has a splendid appearance (sink, towel drier, pool hand-rails and barriers of stairs, balusters, locks, frames and many others). Titanium nitride is a compound of titanium and nitrogen TiNx (x=0.58-1.00), it represents interstitial alloy with a large area of homogeneity, crystals with a cubic lattice. It’s got by nitration of titanium at temperature 12000C or other ways. Application: high-temperature material for different purposes, antiwear coating; color is yellow like a gold. Material of substrate is stainless steel. Thickness of substrate is 0.4-0.7 mm. Titanium nitride coating, thickness is 0.4-0.5 micron; coating has gold color of different shades. Light-diffusion is from mirror to lusterless. Mechanical properties: multiple bending and cold punching are allowed. Atmosphere resistance is 50 years. Titanium nitride (TiN) (sometimes known as “Tinite” or “TiNite” or “TiN”) is an extremely hard ceramic material, often used as a coating on titanium alloys, steel, carbide, and aluminium components to improve the substrate's surface properties. Applied as a thin coating, TiN is used to harden and protect cutting and sliding surfaces, for decorative purposes (due to its gold appearance), and as a non-toxic exterior for medical implants. In most applications a coating of less than 5 micrometres (0.00020 in) is applied. A well-known use for TiN coating is for edge retention and corrosion resistance on machine tooling, such as drill bits and milling cutters, often improving their lifetime by a factor of three or more. Because of TiN's metallic gold color, it is used to coat costume jewelry and automotive trim for decorative purposes. TiN is also widely used as a top-layer coating, usually with nickel (Ni) or chromium (Cr) plated substrates, on consumer plumbing fixtures and door hardware. As a coating it is used in aerospace and military applications and to protect the sliding surfaces of suspension forks of bicycles and motorcycles as well as the shock shafts of radio controlled cars. TiN is non-toxic, meets FDA guidelines and has seen use in medical devices such as scalpel blades and orthopedic bone saw blades where sharpness and edge retention are important. TiN coatings have also been used in implanted prostheses (especially hip replacement implants) and other medical implants. Though less visible, thin films of TiN are also used in microelectronics, where they serve as conductive barrier between the active device and the metal contacts used to operate it. While the film blocks diffusion of metal into the silicon, it is conductive enough (30–70 μΩ·cm) to allow a good electrical connection. 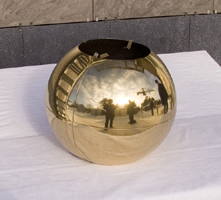 In this context, TiN is classified as a "barrier metal", even though it is clearly a ceramic from the perspective of chemistry or mechanical behavior. Recent chip design in the 45 nm technology and beyond also makes use of TiN as a metal material for improved transistor performance. In combination with gate dielectrics (e.g. HfSiO) that have a higher permittivity compared to standard SiO2 the gate length can be scaled down with low leakage, higher drive current and same or better threshold voltage. Due to their high biostability, TiN layers may also be used as electrodes in bioelectronic applications like in intelligent implants or in-vivo biosensors that have to withstand the severe corrosion caused by the body fluid. TiN electrodes have already been applied in the subretinal prosthesis project as well as in biomedical microelectromechanical systems (BioMEMS). METHOD FOR PRODUCING DECORATIVE SURFACE COATING MATERIALS AND PRODUCTS a method for producing decorative coatings on the surface of materials and articles comprising applying a metal coating film of refractory metal or alloy, followed by annealing in air at a heating rate of 40 - 110oS/min temperature to 200 - 650 ° C and exposure to produce the desired hue. For coatings of golden color product is heated to a temperature of 200 - 445oS and for color from blue to purple - temperutury to 450 - 650C for 5 - 60 min. Decorative coatings using vacuum ion-plasma (vacuum arc and magnetron) sputtering method is widely used due to environmental clean production and high quality of the decorative and protective films. Impediments to the further spread of these methods are: relatively high cost of the equipment required high production standards, strict requirements for quality and purity of the workpiece surfaces. With the help of vacuum methods decorative coatings is possible to form films of various metals and their compounds: titanium zirconium aluminum silver chromium nickel niobium tantalum stainless steel titanium nitride (TiNx), zirconium nitride (ZrNx), titanium oxide (TiOx), zirconium oxide (ZrOx), alumina (Al2O3), titanium oxycarbide (TiCxOy), zirconium oxycarbide (ZrCxOy), titanium carbonitride (TixNyCz), zirconium carbonitride (ZrxNyCz) etc.